Definition: Obtaining, allocating and disbursing adequate funding for human resources. Budgeting and projections for HRH intervention resource requirements including salaries, allowances, education, incentive packages, etc. National health accounts routinely collect data on HRH expenditure. Framework for Purchasing Health Care Labor. World Bank, 2004. Guidelines: Incentives for Health Professionals. Global Health Workforce Alliance; International Council of Nurses; International Hospital Federation; International Pharmaceutical Federation; World Confederation for Physical Therapy; World Dental Federation; World Medical Association, 2008. How to Pay: Understanding and Using Incentives. World Bank, 2004. Interactive Costing Tool Guide. Partnership for Maternal, Newborn, and Child Health–PMNCH and WHO. Managing Your Organization’s Finances. Management Sciences for Health (MSH), 2006. Paying for Performance in Health: Guide to Developing the Blueprint. USAID Health Systems 20/20 Project, 2008. Resource Requirements Tool (RRT). Global Health Workforce Alliance, 2009. Contemporary Specificities of Labour in the Health Care Sector: Introductory Notes for Discussion. Human Resources for Health, 2005.
Financing and Economic Aspects of Health Workforce Scale-up and Improvement: Framework Paper Global Health Workforce Alliance and World Health Organization, 2009. Performance-Based Reimbursement Scheme: A Final Report of a Pilot Study. RTI International, NGO Service Delivery Program, 2006. 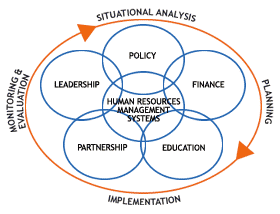 Planning and Costing Human Resources for Health. Glassman, Becker, Makinen, de feranti. The Lancet. Volume 371. Issue 9613. 2008. What Countries Can Do Now: Twenty-Nine Actions to Scale-Up and Improve the Health Workforce Global Health Workforce Alliance and World Health Organization, 2009.